Fossil Rim has been contributing to a study on American red wolves that will hopefully improve the digestive health of the species in captivity going forward. 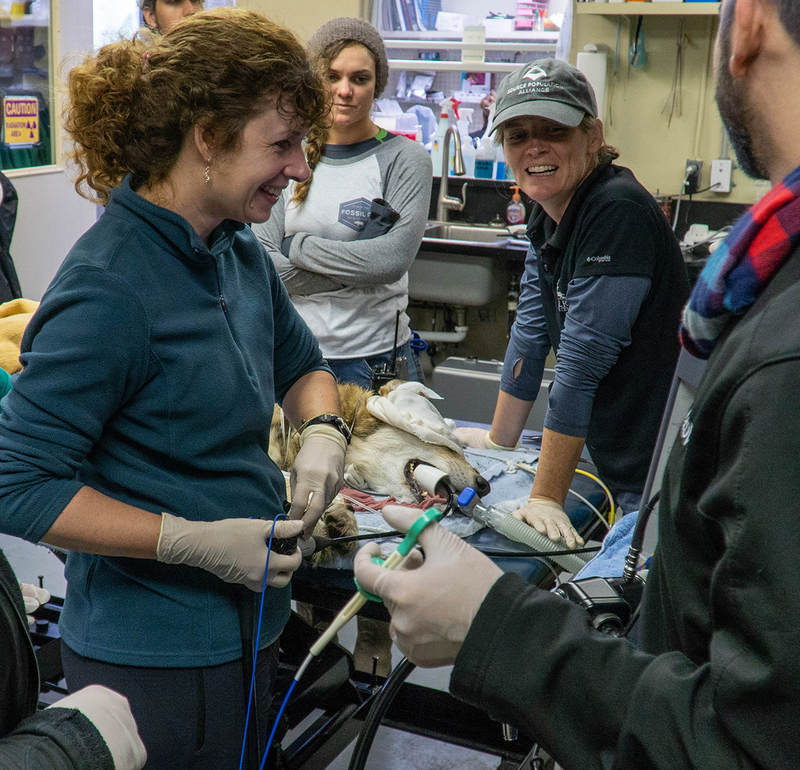 “In mid-March, we did red wolf exams and then performed follow-up exams in mid-October for the Point Defiance Zoo & Aquarium (in Tacoma, Washington) as part of a study on the effects of diet on inflammatory bowel disease within the gastrointestinal tract,” said Fellowship Veterinarian Dr. Rebecca Eddy. “The March exams were prior to the diet change and were done with the help of Dr. Erika Pickens, a veterinary internist at MedVet Dallas. She performed gastric and duodenal biopsies, wherein a scope is placed down the wolf’s esophagus and into the GI tract. 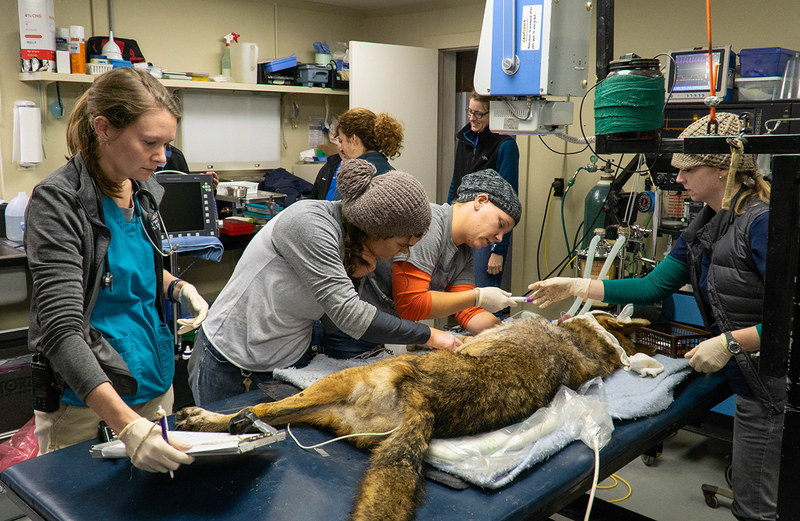 This American red wolf is being prepared for his endoscopy, and prep involves attaching monitoring equipment, beginning gas anesthesia and a blood draw, which Veterinary Technician Allyssa Roberts is doing. Inflammatory gastric disease has been determined to be an issue for captive red wolves, and especially since they are critically endangered, Eddy said any change in diet or husbandry techniques that can be made to improve the collective health of the species is an important problem to solve. 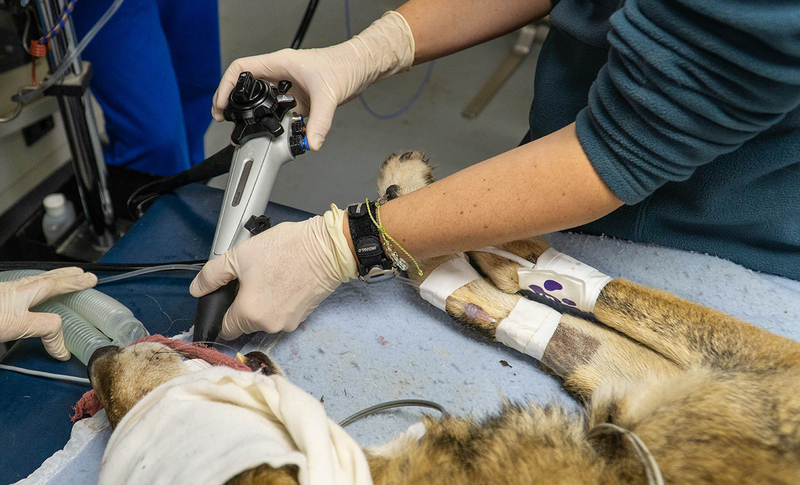 Dr. Erika Pickens takes a biopsy of the red wolf’s stomach. The stomach lining is shown on the monitor so she can position the endoscopic biopsy tool to withdraw a small piece of tissue. Essentially, the study aims to discover if the change to a meat-based diet reduces the severity of inflammatory bowel disease lesions in captive red wolves at the end of a six-month period. Their wild diet is meat-based, after all. 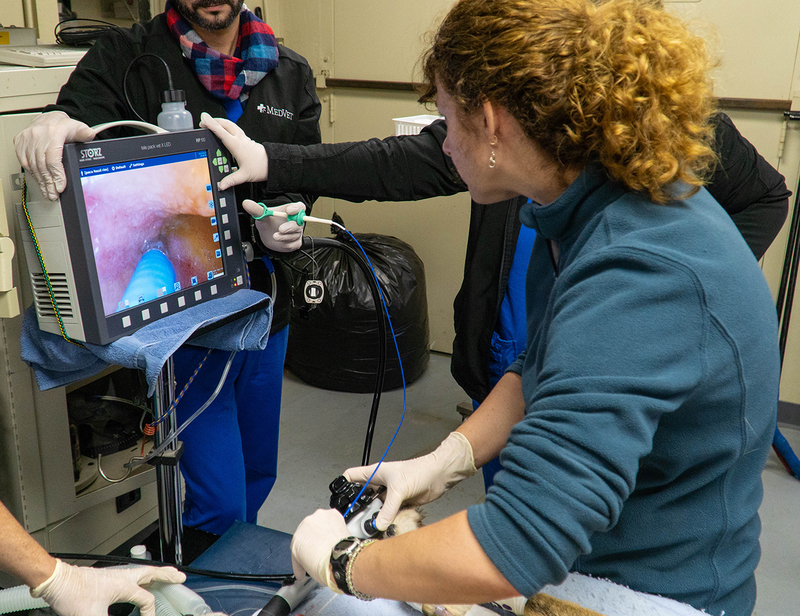 The endoscope enters the red wolf’s mouth and travels through the esophagus to the stomach and proximal part of the small intestine. An effort is made with Fossil Rim wolves to avoid any abrupt diet changes. Due to the small population of the species, it was especially important that Fossil Rim contribute to the study if possible. The red wolf’s stomach and small intestine biopsy is removed from the endoscopic forceps and placed into a small tray for future analysis. Eddy and the animal health department as a whole make sure to never take outside assistance from people like Dr. Pickens for granted. “It’s always exciting when we have outside help come to Fossil Rim to assist us,” she said. “Usually, these are people who are experts in their field and do these procedures frequently, so they provide a great service to our patients. 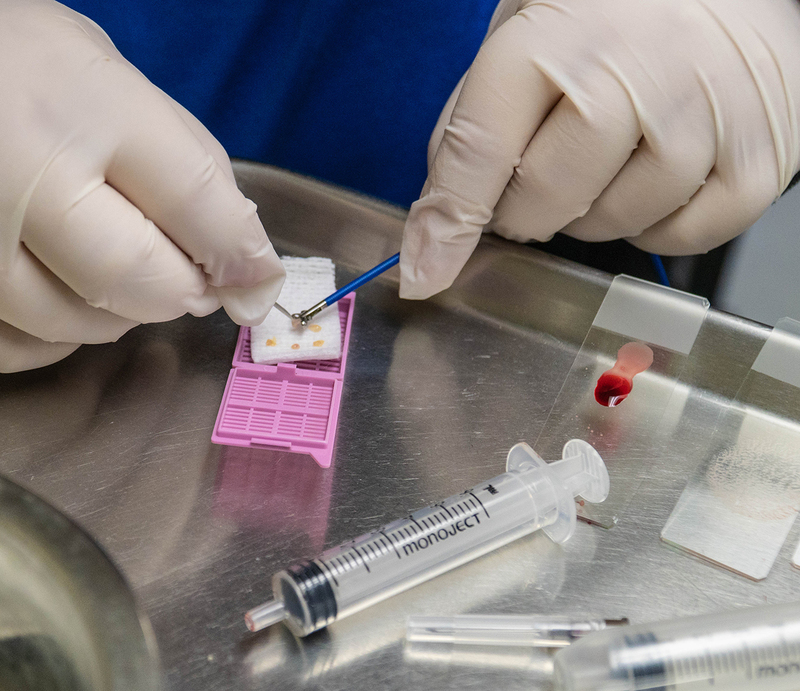 They can perform the procedure at a quicker pace, but still at a high-quality level, meaning less time under anesthesia, which is safer for the animal. “Then, you factor in that they are donating their time and expertise, which is very valuable to a nonprofit. They seem to enjoy coming to help us and often bring their own specialized equipment to aid in the procedure. Dr. Julie Swenson (right) observes Dr. Erika Pickens performing the biopsy procedure via a monitor. 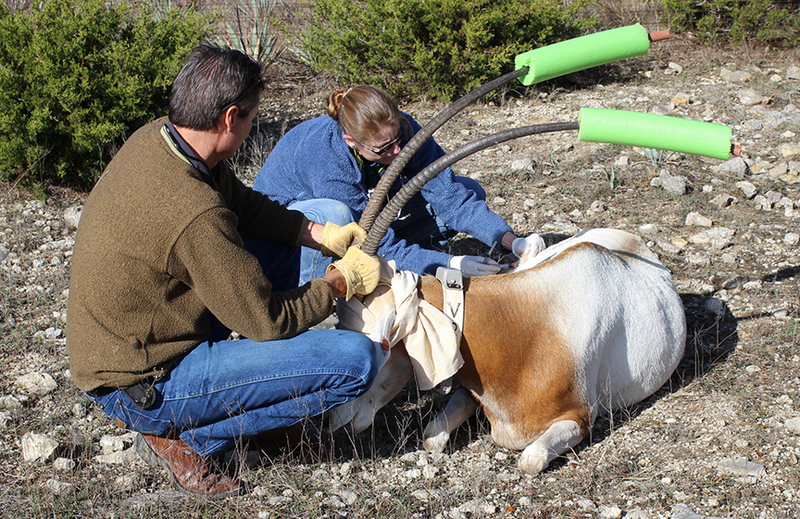 Swenson and the other Fossil Rim veterinarians are very appreciative of the outside help they receive for various procedures. Fossil Rim also utilizes relationships with staff from other facilities through collaboration well beyond the wildlife center’s grounds. “Participating in studies is definitely an important way we can help support other facilities, as well as the animal species,” Eddy said. “But, we try to collaborate in other ways, as well. (Our veterinarians) Holly (Haefele) and Julie (Swenson) do go to other facilities if they are asked to help out and they are able. If Fossil Rim’s collaboration with Point Defiance Zoo & Aquarium does result in findings that improve the quality of life for captive red wolves, it could give the species an important boost as its population continues to travel the road to recovery.